The Nautilus R614 is a popular recumbent bike, with a nice set of features and capabilities especially given its very affordable price tag. With a wide range of built in workout programs, 20 resistance levels and 2 user profiles, it's a solid choice for the home user, with a number of comfort features to make your workouts more enjoyable. The R614 is well-constructed with a step thru design for easy access, a large cushioned seat with ventilation and a large, user-friendly console with LCD display. Nautilus has a nice, affordable lineup of recumbent and upright bikes, with three good choices in each series. The R614 is the base model, as is its U614 counterpart, but it has a lot of unique features in spite of its sub $400 price tag. That's why it has become a very popular choice, and one of the company's best selling bikes. For starters, you get more workout options that you typically get, with 22 programs ranging from heart rate to fitness tests to custom to profile, all as challenging as you want them to be. If you prefer to work out manually, you can choose from 20 different resistance levels, so you have the ability to ramp up your workouts over time, or vary the intensity with a single workout. You can monitor your heart rate with the pulse grips located on either side of the seat. Note that the Nautilus R614 does not have wireless heart rate monitoring like the mid-level R616 and top of the line R618. But you can still get a good reading through the grips. The motion itself is relatively smooth for a low cost exercise bike, and the seat is very comfortable and large enough to accommodate most users. You have a dual track display showing all of your important workout metrics, including time, distance, calories, program, resistance level and more. There's a large window on top with a tablet holder, and a smaller window below so you can still see your stats even if you have your tablet or a magazine covering the top window. Other nice features on the Nautilus R614 include a water bottle holder, a 3 speed workout fan, music capability with a speaker system, rear stabilizers and transport wheels for easy mobility. 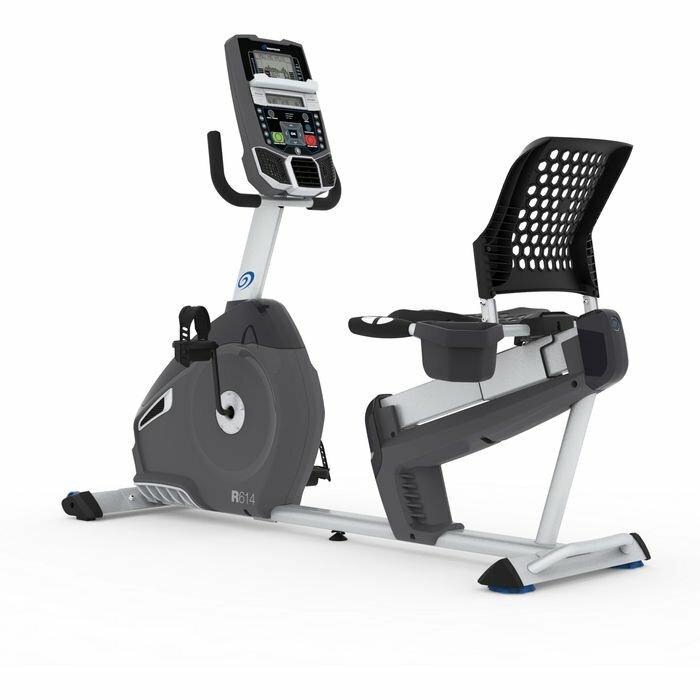 How Does the R614 Compare to the Rest of the Nautilus Exercise Bikes? The R614 and the U614 are the base models in their respective series, so although they have plenty to offer, they are missing some of the features and capabilities that the upper level models have. With the entry level model you get 22 built in workouts, 20 resistance levels, an 18 lb. flywheel, 2 user profiles, pulse heart rate capability and a max user weight of 300 pounds. The step-up R616 recumbent gives you a little more of everything, including 29 workouts, 25 resistance levels, a 22 lb. flywheel and wireless heart rate capability. It also gives you tracking capability via Bluetooth, something the base R614 model does not offer, and upgraded seat, pedals and grips. With the top of the series R618 everything is upgraded, with more premium pedals, handlebars and a gel-infused cushioned seat. It has a heavier 30 lb. flywheel for smoother, quieter motion, and the company includes a free wireless chest strap for heart rate monitoring. It's also sturdier/heavier than the R614 and R616, with a higher max weight capacity of 325 lbs. as opposed to 300 lbs. on the others. Comparing the R614 vs the R616 and R618, you can see that it is more of a beginner/entry level model than the others, built for lighter use by one or two individuals. For heavier use, the R616 and R618 are probably better options for you, as they are more durable recumbent bikes. They also have workout tracking capability that more and more users are demanding these days. The good news is that all of the Nautilus exercise bikes are very affordable, and there's only a few hundred dollar difference between the base R614 and top of the line R618. The same is true for the upright versions, if that is something that interests you. If you're in the market for a good recumbent exercise bike, the R614 is a a very good choice, especially given its low price tag. You'd be hard pressed to find a similarly priced bike with this many features and capabilities. You get a lot of workout programs and resistance levels, smooth motion, a couple of user profiles, heart rate monitoring and a lot of comfort features like a workout fan, water bottle holder, tablet holder and music compatibility with a good speaker system. If you think you need something a little more durable, check out the R616 and R618 models, which offer more of everything including wireless heart rate monitoring and Bluetooth workout tracking. Whichever Nautilus exercise bike you choose, check out the prices at Amazon as they often have the best deals. And see if they offer an extended warranty, as the coverage on many of the Nautilus cardio machines isn't ideal.